Out in theaters November 22nd! As uplifting as the tale of Scrooge itself, this is the story of how one writer and one book revived the signal holiday of the Western world. The journey that led to Charles Dickens' creation of "A Christmas Carol," a timeless tale that would redefine the holiday. 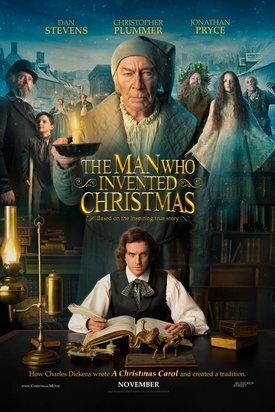 Directed by Bharat Nalluri and starring Dan Stevens, Christopher Plummer, and Jonathan Pryce, The Man Who Invented Christmas is based on the book by Les Standiford. You can also watch this extended featurette, including interviews with the cast, producers and author Les Standiford. You can read the New York Times review of the film here. And check out these interviews with Les Standiford from CBS4 Miami and WSVN7 Miami below! Based on the New York Times “Editors Choice” and New York Times Best-Seller!